EDITOR’S NOTE Since some months, everyone talks about Industry 4.0 as the new era of the production sector, where ICTs and digitalization systems are particularly important. Experts say that the arrival of these new technologies to industrial environments is a strong reason to start talking about the beginning of the Fourth Industrial Revolution. In CARTIF, we have worked on the development of some technologies called ‘digital enablers’ since some years. These technologies allow industry take advantages of its potential, thanks to the connection between the physic and the digital world, applied to the production processes, rising benefits and reducing risks. 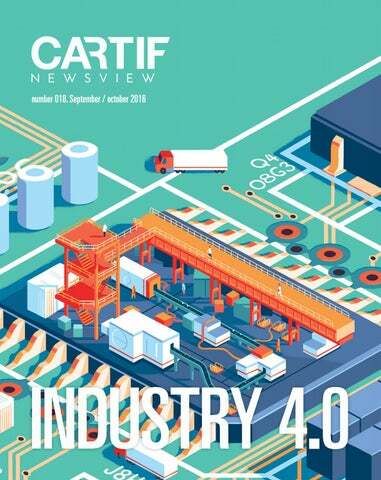 For this reasons, this last CARTIF NEWSVIEW is focused on the group of technologies such as Augmented Reality, Internet of Things, Collaborative robotics or Big Data, which offer a large list of innovative solutions to solve daily problems in manufacturing processes. It is the moment to start with the necessary changes in order to maintain the competitiveness. keywords industry 4.0 connected industry From the second half of the eighteenth century to the present, the global industry has lived several and deep transformations in order to adapt itself to the demand and take the most of the suitable technology. The advent of Information and Communication Technologies (ICTs) to factories has allowed the interconnection of means of production, resulting in what is known as ‘Intelligent Industry’. However, the Industry 4.0 goes a step further. The term ‘Industry 4.0’ is not an unknown concept. This new conception of production establishes a wider interconnection in which the means of production interact not only with the environment of the factory, but also with the entire value chain of the production process, composed by suppliers, customers, logistics, etc. industrial revolutions digital enablers Currently, this purpose of companies’ digitalization marks the inflection point for the arrival of the ‘Fourth Industrial Revolution’, and it has turned into a strategic priority to maintain a sustainable and balanced economic model. The application of technology has given room to the emergence of new processes, products and business models. The society follows a parallel path, and it is digital now. Consumers are adapting their lives, without possible resistance, to the advent of new technologies that have changed habits to evaluate, choose and buy products. The industry should increase flexibility in its processes and adapt itself to the demands of its ‘hyperconnected’ clients, involving them in the process. Industry 4.0 provides a bigger ability to adapt to the current situation, which is the key to maintain competitiveness and leadership positions in the market. Although this is in evolution and development phase, this new challenge of connected industry is allowing (for those factories that have already implemented it) and will allow (for those factories that have not implemented it yet) cost reduction and production increase, the main objective of industry throughout history. The main benefits of Industry 4.0 are summarized in these three: continuous innovation and collaborative way in the value chain in the process and the final product; access to new business models; and the rapid reaction and adaptation to changing market conditions. PARK(ing) DAY Los Ángeles, EEUU. A few days ago, during the celebration of a day on Industry 4.0 in ITAINNOVA, the head of Return on Innovation in Telefónica, Luis Ignacio Vicente del Olmo, claimed that ‘Those companies that do not face the digital transformation, they will not survive’. As it is usual in processes of change, they develop faster than the industries and companies are able to assimilate. In fact, the adaptation of enterprises to new information and communication technologies is carrying out more slowly to its implementation in society. The transformation capacity of companies is very large and the time to change is now. The technologies needed to carry out this revolution are already available. These are called ‘digital enablers’ and each industrial revolution throughout history has had theirs. The first one was made possible thanks to inventions like the steam engine or mechanical loom. The second brought some advances like electricity or the assembly of cars. Finally, in the third one, disruptive technologies such as robotics, microelectronics and computer networks appeared in industries. In the case of the fourth, the enablers try that this new concept of industry makes us of its potential by the union between the physical and the digital world. overlap in real time of the image information provided by our device. This tool can be a smartphone, a tablet or smart glasses. There are a lot of applications of augmented reality are very varied, from professional fields so different such architecture or marketing, to medicine or education. In the industrial area, CARTIF is carrying out projects about maintenance of facilities. One of them is SARA project, whose aim is to develop a new concept of assistance for manual assembly positions in industry, that is, for those processes that cannot be performed by robots. The innovative system parts from the idea that the operator is assisted by visual monitoring of its operations and instructed by spatial augmented reality projection on the job, and eliminate any errors in the assembly. This enabler allows following the evolution process of a product production. The traceability of a product triggers a more efficient serviced and avoids added expenses. 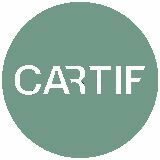 In this sense, CARTIF has developed its own advanced management system for small and medium enterprises: SAGIT. It is a tool that optimizes processes and resources, makes an exhaustive monitoring of any process, knows her â&#x20AC;&#x2DC;storyâ&#x20AC;&#x2122;, from the components used in its preparation, the processes applied, the resources used, etc. Despite its initial function of giving solutions to traceability requirements in agro-food industry, now SAGIT has developed through a multi-sector solution, able to manage every kind of enterprise of every field. Predictive Maintenance Maintaining machinery industry has been one of the biggest headaches for factory workers throughout the history of industrial sector. Why suddenly does a machine break down? When will it do again? How long will production be interrupted? The predictive maintenance is based on the periodical review of machines using characteristic signs, which are able to indicate an anomalous working in advance. The main objective is to reduce unexpected breakdowns and reduce periodical reviews. This kind of maintenance is one of the disciplines in which CARTIF has working since its beginning, and this is the aim of CALYPSO projectâ&#x20AC;Ś. Big data The three â&#x20AC;&#x2DC;Vâ&#x20AC;&#x2122; of Big Data (velocity, volume and variety) reflex the challenge that companies in any sector face in order to control all data from their processes. Giving value to this wealth of information to make better decisions, increasing profits and reducing risk, is another goal of Industry 4.0 The final objective is to turn data into useful information that make easier the decision making. A right storage and processing of these data allow us to understand the needs of customers. It is, therefore, a business opportunity. are designed to operate in a shared workspace with workers without the usual protections. The main premise in the design of them is the safety of workers. In CARTIF, we refer to spaces for collaboration between workers and robots, instead of collaborative robots. In a collaborative environment, the worker can provide skill, flexibility and, especially, ability to identify, understand and solve problems, while the robot can offer repeatability, accuracy and endurance. Internet of things (IoT) Another characteristic of Industry 4.0 is the possibility of Internet connection in every object in a factory; a piece, a motor, a toolâ&#x20AC;Ś The Internet of Things intends to apply the potential of connectivity to manufacture, achieving higher performance and profit, increased safety, efficiency and competitiveness, and, finally, the ability to adapt the product to specific user needs. Cybersecurity With the arrival of every these new technologies to industrial environments, one of the biggest worries is security. In Industry 4.0, systems communicate between each other in order to collect data, share information, make decisions and control industrial production systems. While in traditional industry have developed specific regulations to ensure safety, now it is necessary to apply the appropriate security measures to prevent these systems suffer attacks. These attacks could block the correct development of their duties. The cybersecurity should ensure the availability of facilities, manufacturing processes and CPS systems (cyber-physical systems); the integrity of the developments and processes, and communication between them; and finally, the confidentiality of information and data that collects and handles these systems. These are only some of the technologies that enable industry to make the most of its potential. However, the most interesting part of enablers is not their individual characteristics, but their capacity to combine among them and offer a big field of innovative solutions to specific problems in every company. There is not going back. The industry is undergoing a radical change and companies need to join this unprecedented paradigm, otherwise they will stay behind compared to other competitors. We cannot forget that the ultimate goal of all industrial revolution throughout history has been implementing innovative solutions in order to improve processes, increase profits, reduce risks and generate a product or service more competent in the market and most close as possible to consumer demand. The Fourth Industrial Revolution has come to stay and redefine industrial processes work. the project Life LEACHLESS The main goal of this European project is to promote water resources management action in accordance with Water Framework Directive 2000/60/EC by enabling managers of landfills and waste treatment centres to achieve good qualitative and quantitative status of their effluents. The final effluents will be reused for cleaning and gardening purposes. A minority semi-solid residual stream will be also generated in the process. Due to its special composition (rich in metals and inorganic elements), this stream will be valorized in ceramic industries to improve the final products characteristics. Large amounts of leachates are generated in Europe and, because of their composition, having a high pollution load. The LEACHLESS project proposes a treatment model that will be carried out â&#x20AC;&#x2DC;in-situâ&#x20AC;&#x2122; using a cost-effective novel technology that combines solar evaporation/condensation plus forward osmosis. The prototype will be powered by renewable energies (solar energy, biomass and residual heat), which will minimize the carbon footprint of the process. The final effluent quality will be very high, allowing reuse (preferred) or discharge into watercourses. The results will be replicated in the facilities of two European cities, Botarell (Spain) and Athens (Greece), and the consortium will study the possibility of transferability of the LIFE LEACHLESS model to other facilities and EU members. This project has three main objectives. On the one hand, demonstrating the technical an economic feasibility of an innovative concept for leachate treatment based on solar evaporation/ condensation plus forward osmosis, by reducing, in the most efficient way, the environmental impact associated with leachate generated at management activities. On the other hand, valorising highly pollutant effluents by completely reuse of the streams generated in the treatment process. And finally, the project wants to provide to managers of facilities generating leachate with a cost-effective process for on-site treatment of emerging pollutants and pathogens, among others compounds as metals or inorganic and organic matter. The consortium of this project is composed by CARTIF, as coordinator, Infinit Value Engineering, the National Technical University of Athens and Triton Water Technologies, and will be implemented in Greece and Spain.